Before sending a contact, have we answered your question below? If not please call us, email us, visit us in store or send a message via the contact form. We look forward to hearing from you. 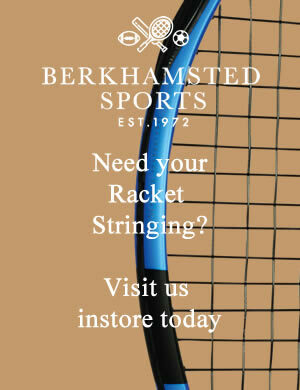 Do you offer an onsite racquet stringing service? Yes we have facilities to string for Tennis, Squash or Badminton. Just pop your racquet along, drop off and stay and wait. Do the prices listed include VAT? Yes all prices include VAT at the current rate. Can I collect anytime with your Click and Collect service? Is my purchase covered by any warranty? Any product sold by Berkhamsted Sports found to have a defect is subject to a replacement or refund policy in line with the manufacturer’s warranty. Any product returned due to a defect will be examined by staff upon receipt of both the product and proof of purchase. The repaired product or a replacement will be provided in a timely fashion pending stock availability. Should a replacement product be unavailable a similar product shall be substituted as an alternative with the customers agreement. Berkhamsted Sports reserves the right to return the product to the customer (at the customers expense) if no defect is found. This does not affect the customers statutory rights. If I am unsure of the correct size, can you help me? If you are unsure of what size to order, why not pop into our high street store and let us help you select the right product for you. We have many years of experience and will always find the right product size for you.